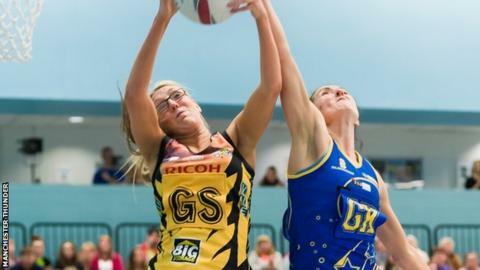 Netball Superleague: Who will be crowned champions? After 14 rounds, the ninth season of Superleague has reached the knock-out stages, with only four teams remaining. The semi-finals take place on Monday, 21 April between the top four sides - Surrey Storm, Manchester Thunder, Team Bath and Hertfordshire Mavericks. Storm finished the regular season unbeaten at the top of the standings and face local rivals Hertfordshire Mavericks, who are searching for their third title. Tracey Neville's Thunder host reigning champions Team Bath, who are looking for a repeat of last year's victorious play-off campaign. Here, BBC Sport looks at the prospects for each franchise, with expert analysis from the teams and commentator Caroline Barker. Previous success: Semi-finalists in 2013; Losing finalists in 2012 and 2011. Yet to claim silverware. Analysis: Caroline Barker says: "Although Tamsin Greenway would have you think they don't have superstars, there's been plenty of stand-out players for Surrey Storm this season. Greenway's performance could have forced her into the England setup had she wanted, while shooter Rachel Dunn's accuracy under the post has earned her a call-up to the tour of Australia and she could yet be named Superleague player of the season. If their spirit and pairings on court continue to click, then that unbeaten run looks unstoppable." Club views: Coach Tamsin Greenway told BBC Surrey: "It's easier going in as the underdog, but now we're the team to beat. We know we can beat all the teams but it's now about how we prepare for the occasion. We've not been out of the top four since we started but we've never won. But this season we're in the best position we've ever been in. We don't have the superstars or the same sort of players other teams have but the girls work so hard for each other and they believe. Analysis: Caroline Barker says: "If you want a coach who demands blood and thunder on the court then look no further than Tracey Neville. Her often surprising tactics have propelled her young guns forward again this season. With some incredible finds such as young shooter Helen Housby, Neville's not afraid to mix it up. And in Sara Bayman she has the mid-court leader to take them to the final." Club views: Coach Tracey Neville told BBC Sport: "It's a repeat of last year's semi-final so this is no doubt going to be a well-contested match. I do think the game is going to be won in the attacking goal third, with both teams having to step up their consistency, tenacity and determination to come out with the win." Assistant Coach Karen Greig added: "It is a huge game and Bath will pose lots of questions but with our squad and the different combinations we can put out in all four quarters, we have the answer to combat that." Analysis: Caroline Barker says: "Ominously for all around them, Team Bath are building up momentum heading into the semi-finals. The reigning champions ooze experience and talent throughout the court. From the irrepressible England captain Pamela Cookey, to club captain Serena Guthrie at centre and Stacey Francis in defence - there is energy, ability and, above all, experience in Jess Thirlby's team. If they all play to their strengths then I wouldn't bet against seeing Surrey Storm against Team Bath in the final." Club views: Goal attack Pamela Cookey told BBC Radio Bristol: "We beat Manchester away in the league game so we've got that under our belts. But we won't rest on that, we know we've got to play so much better if we want to win again. We've had an up-and-down season but we did well to come third. We're peaking at the right time and we are definitely ready for Monday." Analysis: Caroline Barker says: "Who can forget the Mavericks' tussles with Storm this season? They've been epic and the record-breaking match at the Copper Box was historic. Despite losing twice to Storm this season, Herts know how to play these occasions and certainly have those leaders across court - and not just the Corbin sisters [Sasha and Kadeen]. Shooter Sophie Hankins has been a revelation and defender Layla Guscoth has had moments of brilliance this season. If she can handle the Surrey attacking unit and disrupt their flow then Mavericks will have the foundation to take them to the final." Club views: Coach Karen Atkinson told BBC Sport: "The semi-final against Storm is going to be a classic. We have lost to them both times in the league but by only two points each time. That is nothing in netball terms. One less turnover from us, one more interception and it is a different result. Storm have been very consistent all season with probably the lowest error rate so we need to remain composed throughout the 60 minutes. It is anybody's game on Monday."